Deep Dish Apple Pie…Oh My! I stumbled across a Pampered Chef Deep Dish Pie Plate in my garage. I got this plate as a gift; however, I never used it then forgot about because it was buried amongst random stuff in my garage. Well, once I pulled it out of the box, I knew I had to make something amazing and delicious! This particular pie plate is stoneware and I immediately fell in love with it and now I want to purchase everything in the stoneware collection! I had some Granny Smith apples in the fridge, so I decided to make a deep dish apple pie. Deciding on what to make was the easy part, but determining which recipes to use…well, that was another story. After browsing allrecipes and recipeszaar for what seemed like hours, I finally decided on the crust recipe and the filling recipe. The topping I winged from a previous apple tart that I made, it includes rolled oats, which in my opinion takes a typical crumb topping to another level! This pie turned out delicious…the apples cooked beautifully, the caramel sauce in the pie added just the right amount of sweetness and the crust was tender and flaky! I am posting each recipe with my adaptations. The links will take you to the original recipes. If you have some extra time this week, get in your kitchen and make this pie. I promise you will not be sorry! In a small bowl, mix egg with water. Blend into flour mixture. Chill in refrigerator until ready to use. Notes: I halved the original recipe which was perfect for a 9 inch deep dish pie plate. The recipe I posted is the halved version. 1. Melt butter in a sauce pan. Stir in flour to form a paste. Add white sugar, brown sugar and water; bring to a boil. Reduce temperature, and simmer 5 minutes. 2. Toss the apples with the cinnamon and nutmeg. 3. Meanwhile, place the crust in your pan. 4. Fill with apples, mounded slightly. Gently pour the sugar and butter liquid over apples. Pour slowly so that it does not run off. Cover with crumb topping (recipe below). Prepare Oatmeal Streusel Topping by combining flour, teaspoon cinnamon, nutmeg, brown sugar, and oats. Mix thoroughly, then cut in butter until mixture is crumbly. Apple pie is one of my favorites! oh my is right! I love how thick this is and not runny at all. Perfect. What fantastic pics! I want a slice NOW! I will be bookmarking this to make soon! Oh! My… hide that page from my family! if not, I’ll be in trouble and will have to make dozens of those! Thick apple pie is the absolute best and this one looks magnificent. 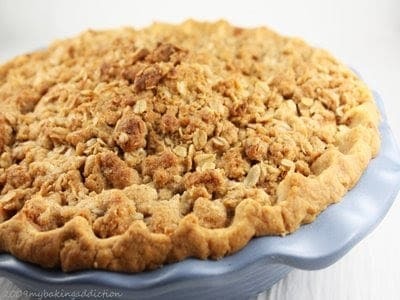 Man, this apple pie looks amazing. I’m so glad that you took out your deep dish pie pan. And, you did all the work and found the best apple pie component reicpes for us. Totally awesome! 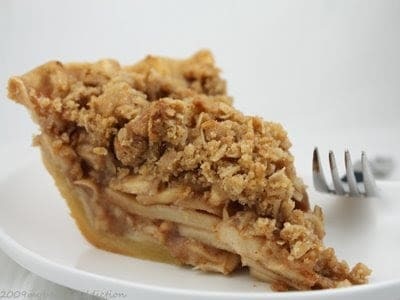 I love, love, love apple pie with crumb topping. Yours looks amazing. I really need to post mine one of these days. Pingback: Apple Pie « It's the Cookie Monster! Loved this apple pie. I made it Friday night for my husband’s birthday and he said that I need to keep this recipe because it is the best ever. I love the idea of a caramel sauce! Do you think I could do a crust on top? I am a pie crust addict! Just wondering if it would be too wet for a pie crust on top. Phenomenal! I made it tonight, and it was a big hit with my family. We used a combination of Jonathan, McIntosh, and Ida Reds, which worked well. It was my first time using my garage sale Pampered Chef deep dish pie plate, too:) Thanks!